Be the first to share your favorite memory, photo or story of Nelson. This memorial page is dedicated for family, friends and future generations to celebrate the life of their loved one. 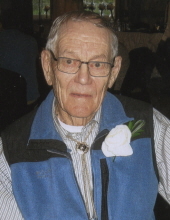 On Saturday, April 13, 2019 Mr. Nelson Tyler of Vermilion, formerly of Mannville, passed away at the Vermilion Health Care Complex at the age of 89 years. Nelson is loved and remembered by his wife Gerry Tyler of Vermilion, daughters Carol Cesonis (Darrell Zimmer) of Blackfalds, Sharon (Larry) Cannan of Mundare and Connie (Ron) Herman of Sherwood Park; grandchildren Garrett (Danielle) Cannan, Christine (Chris) Kerr and Tyler Herman (Maddy Roberts); great grandchild Brooke Cannan and sister Beatrice Kenzie of Vermilion. He was predeceased by his first wife Katie Tyler, daughter Marlene Yanitski and his parents Albert and Winnifred Tyler. A Celebration of Life for Nelson is being held at 3:00 p.m on Friday, May 3, 2019 at the Vermilion Elks Hall. Donations in memory of Nelson may be made tot he Alberta Heart and Stroke Foundation or the Vermilion and district Housing Foundation. "Email Address" would like to share the life celebration of Nelson George Tyler. Click on the "link" to go to share a favorite memory or leave a condolence message for the family.